Great Leadership: Is that Development Goal Really Worth it? When it came to individual development planning and coaching, I never used to be a fan of adding a lot of muckety-muck to the process. I’ve always felt that way when it comes to most HR and leadership development processes – simple is always better. I’ve developed that perspective from devoting my career as an internal practitioner working with a lot of busy, impatient, hard-charging executives. 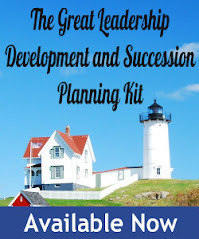 Given the nature of succession planning cycles, most of them ended up scrambling to create individual development plans (IDPs) at the last minute all at the same time, and it was my job to help them. Out of necessity, I perfected the “45 minute drive-by IDP”. However, I’ve learned that there are times when it’s important to slow down, step back, and take the time to think through the implications of a development plan. After all, it’s relatively easy to create a spiffy looking plan with all of the right buzz words, but its hard work to actually change your behavior. Way hard! When the going gets tough, people can give up, throw up their hands, and tell themselves and others “that’s just the way I am”. One way to increase the chances of changing behavior is to ask yourself or others that you are coaching a few “return on investment” (ROI) questions before a development goal and actions are committed to. Taking the time to consider the implications of changing – or not changing – will help create the internal motivation, ownership, and commitment to change. 1. If I get better at (add the behavior you want to improve), one benefit will be: ________. Don’t be satisfied with one of two benefits – keep asking the question. Sometimes the most valuable benefits take a while to bubble up. 2. How will the company or my organization benefit? See if you can connect the dots to your organization’s mission and measurable objectives. 3. How will changing this behavior help me achieve my business and personal objectives? 4. What will happen if I don’t change? 5. What will be the cost of changing this behavior? Even where there are lots of benefits to change, all change comes at a price. What will you lose by changing? What will you have to give up? How much effort will it take? Once you’ve answered each of these questions (or the person you are coaching has), decide if it’s really worth changing the behavior. People won’t change their behavior if they don’t want to – and neither will you. Even if there a lot of positive benefits to changing, it just might not be worth the cost and effort. The point is, you (or someone else) need to make a decision. Only then should you move on to deciding how you’re going to change. Otherwise, you’re wasting your time. Learning a new behavior, or eliminating a bad habit, takes a lot of discipline, practice and a dose of humility. No one gets it right the first time, and it takes up to a year to get completely comfortable with it. Going back and reviewing the answers to these five questions might just give you the inspiration you need to stick with it. Note: Credit and thanks for these coaching “ROI” questions goes to executive coaches Mary, Susan, and Marshall Goldsmith. Here's a question. I have argued that mentorship and sponsorship are distinct from leadership (see http://www.thewordenreport.blogspot.com/2013/04/on-roles-of-mentors-and-sponsors-in.html). Now, if that is so, then "coaching" is also not leadership. In baseball, who leads the team: the coach or team captain? A coach, like a leader, motivates. Yet a coach seems to be on the side, rather than on top. Although this is the first time I'm leaving a comment on your site, your Great Leadership blog is my favorite source of great implementable ideas. I am really intrigued to hear about the 45minute drive-by IDP -- can you share more? The WR - thanks for your comment. How nice of you to say that, and thanks for leaving your first comment. I would write the first draft for them. While it worked for some, I'm afraid for many it was a "check-the-box" exercise, resulting in little change. While better than nothing, it's better to invest the time needed to create real change. That can't be done in 45 mintues.